Minosa: A Modern Classic as featured in Home Beautiful. The offending tiles were ripped out, along with everything else, to make way for a complete overhaul. April chose designer Darren Genner of Minosa to create a sophisticated urban retreat. “I walked into the showroom and fell in love with their cabinets and shelves,” she says. Keeping the basic layout the same saved on plumbing costs and made the construction phase of the renovation fairly simple. April opted for a softer, modern take on traditional monochrome for the colour scheme. The dark chocolate tones of timber-effect tiles have been teamed with white for a balanced look that makes an immediate impression as you walk into the room. “Working with narrow spaces is always a challenge, so we chose to wrap the floor tiles up one wall to make the space feel taller,” says designer Darren. One of the most effective design decisions was doing away with a bath altogether. Instead, April and Stephen opted for a wet room shielded by a sheet of frameless glass. The back wall is completely free of fixtures and tiled in pure white to create an open feel. The finished room is minimalist yet relaxed, and just goes to show that you don’t need a huge area to make big improvements. Playing with different heights can make the most of a small space, drawing the eye to varying points in a room. The floating Minosa basin and display shelf are positioned asymmetrically up the wall for a striking feature. An extra surface space is created for storing items such as guest towels and soaps. Floating fixtures increase the sense of space in the room by exposing the floor underneath. While the old sink appeared to jut out into the room, the new streamlined basin has become a sleek internal fixture. April’s favourite feature is the timber-effect porcelain tiles, from Earp Bros, that line the feature wall and floor. “I love the texture and the shape,” she enthuses. “We wanted brown tiles, but not beige, and these were perfect – they’re unusual but they work, and they feel great underfoot.” The tiles’ grained effect imbues the room with warmth and character. 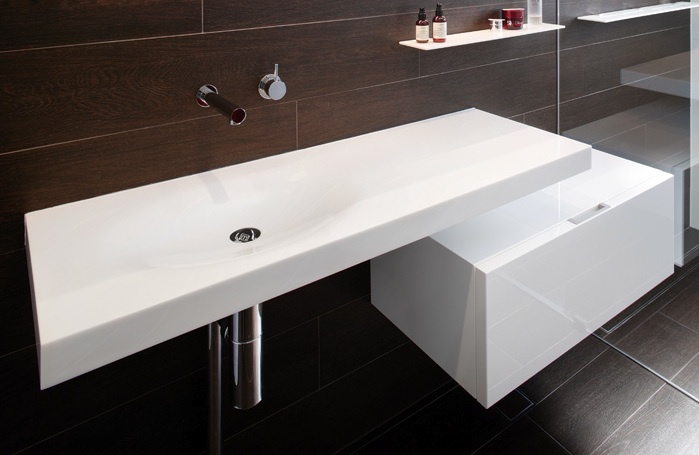 The bathroom’s streamlined style cleverly disguises its storage space. Everyday essentials are kept within easy reach, yet out of view, in the floating drawer unit and recessed mirrored cabinet. “The cabinet is so useful,” says April. “We’ve got powerpoints in there for my electric toothbrush and hair straightener, and it’s nice to conceal things like that.” The cabinet lights up thanks to a row of LEDs installed underneath. “We put them on in the evenings and they look fantastic, and we don’t need to turn on any other lights,” says April. The Parisi toilet is tucked away behind the bathroom door, so it’s not the first thing you see when you walk into the room. In keeping with the sleek lines of the rest of the bathroom, the unit has a slim cistern that doesn’t take up much space. Bulky items, such as cleaning products and bath towels, are all stored out of sight in the floating drawer unit from Minosa. Made of polyurethane in a gloss finish, it is a stunning counterpoint to the textured matt finish of the floor and wall tiles. April avoided cluttering the space by choosing Australian-made wall-mounted tapware from the ‘Classic’ range for Minosa. It contributes to the room’s minimalist look, and when it’s placed on the wall, it frees up extra vanity space.